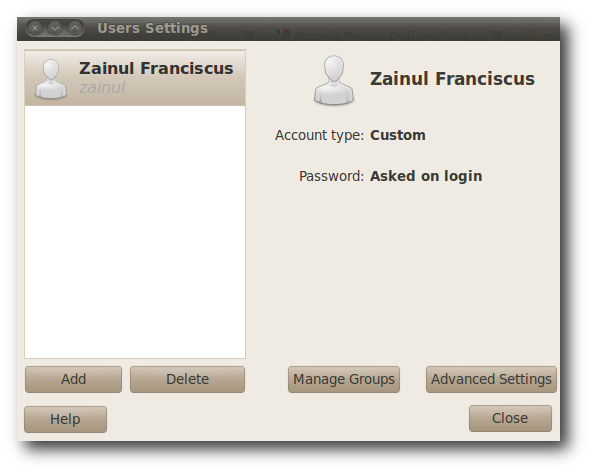 Ubuntu used to allow me to change user's groups and advanced settings within the "User Settings" GUI. These options are gone now in 15.04. Where do I go to find these settings? This is the old dialog with "Manage Groups" and "Advanced Settings" buttons. Not the answer you're looking for? Browse other questions tagged users gui settings 15.04 groups or ask your own question. Upgrade to 15.04: What happened to my gnome-terminal tabs? How to configure the Compose key on Ubuntu 15.04? How change user password in Ubuntu-Studio GUI? How to add an existing user to an existing user group and verify it is added?